Maybe you’ve made Salmon Cakes before. Maybe you haven’t! Either way, I want – scratch that – NEED you to make this version and then report back to me. Hopefully you’ll be all smiles and well-fed! I think you’ll really love them. 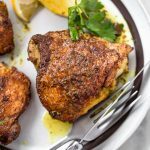 Unless of course you’re not a fan of salmon, or fish in general, in which case you may want to make this Whole30 Chicken Piccata instead? I should also clarify for a very, very small percentage of readers that these cakes are not intended to be eaten as a dessert. Instead, think of them as a burger that you attack with a fork and knife. Or, if you’re me on a Wednesday morning after 30 minutes of fasted cardio, with your bear hands. Which brings me to my next point. 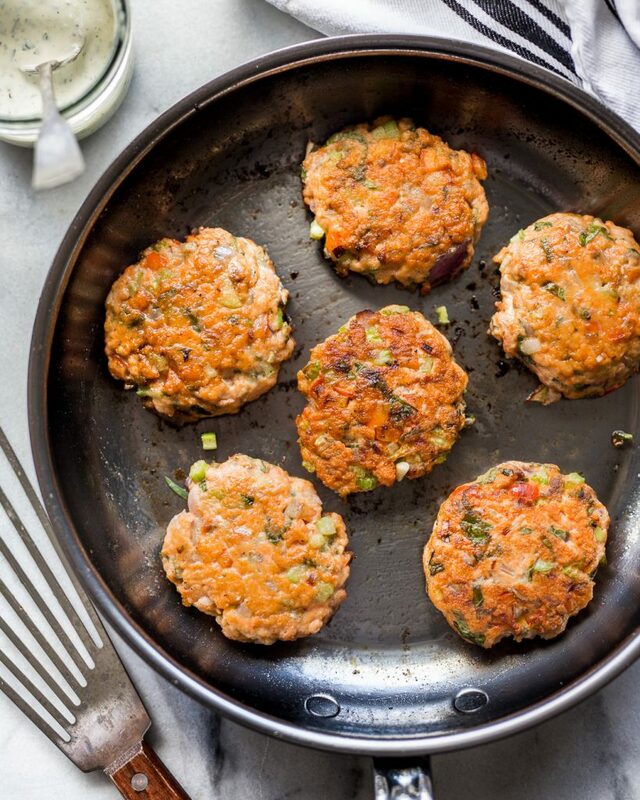 The versatility of a great salmon cake is hard to beat. They’re great for breakfast, lunch or dinner. But not dessert – we’re clear on that point, right? 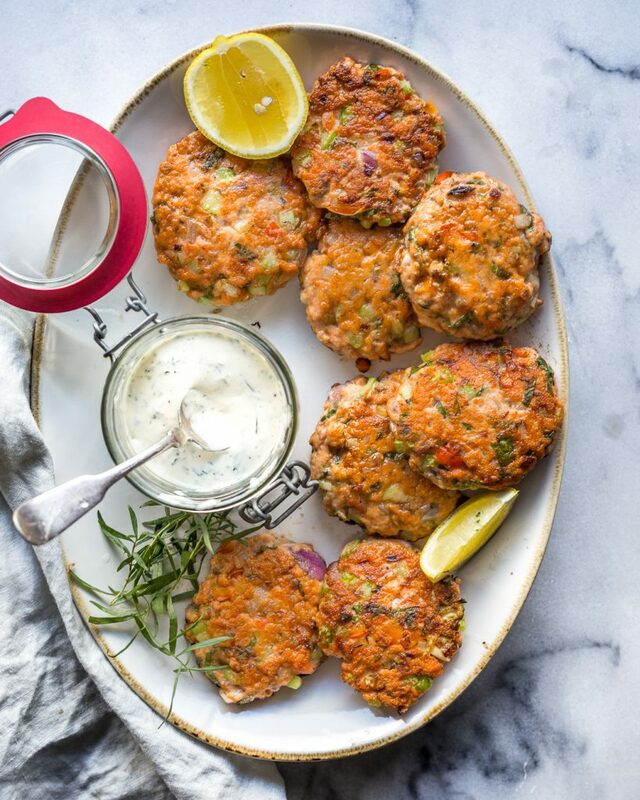 These Salmon Cakes are EASY to make! These Salmon Cakes are DELICIOUS! 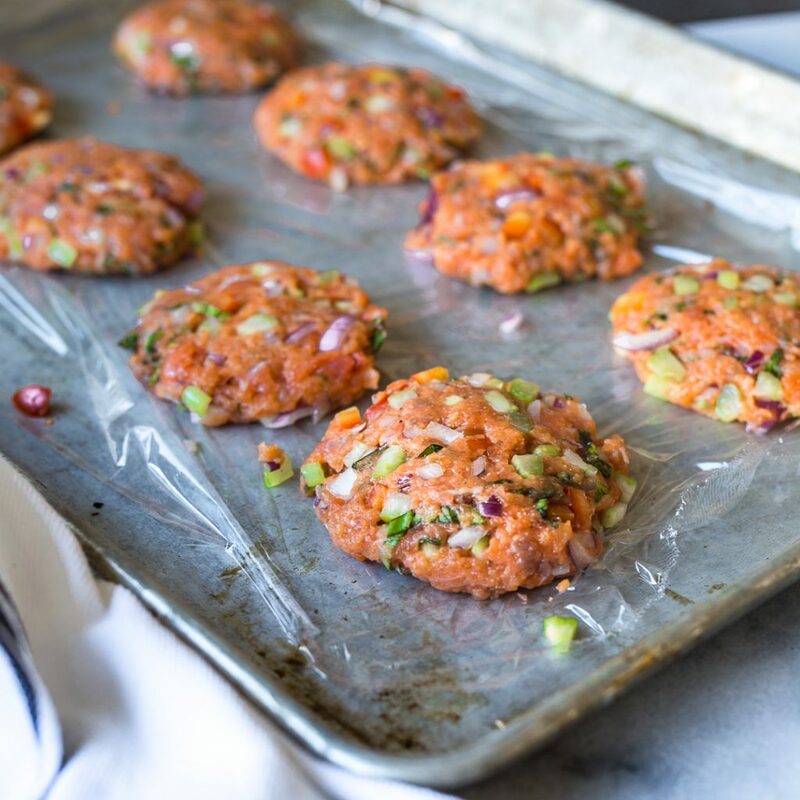 These Salmon Cakes are WHOLE30 & PALEO! These Salmon Cakes can be MADE AHEAD OF TIME! 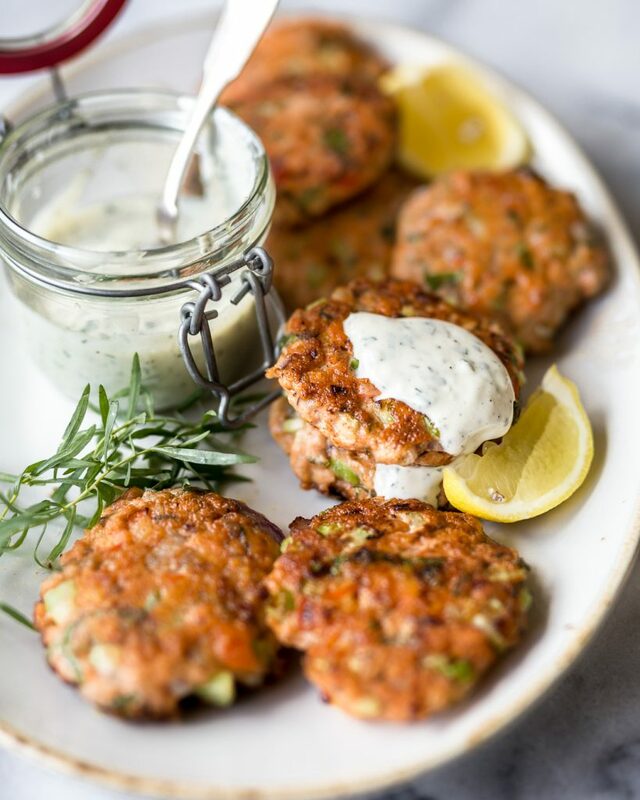 These Salmon Cakes are best served with my killer TARRAGON AIOLI! Let’s address the above in order, shall we? Secondly, the flavour of these salmon cakes are through the roof! I strongly encourage you to use fresh, raw, wild salmon here. Avoid salmon from a can – as tempting as it may be. Even if it’s compliant and wild. Canned salmon is too wet to pull off without a binder. It’s also pre-cooked which will result in a drier finished product.I must say that for a salmon cake recipe that calls for no binders or dredging, these hold together unbelievably well. Just make sure to add enough avocado oil to a preheated, high-quality nonstick skillet (stainless steel and cast-iron works here as well). I used my Hestan Nanobond Steel Fry Pan (available at Williams Sonoma). 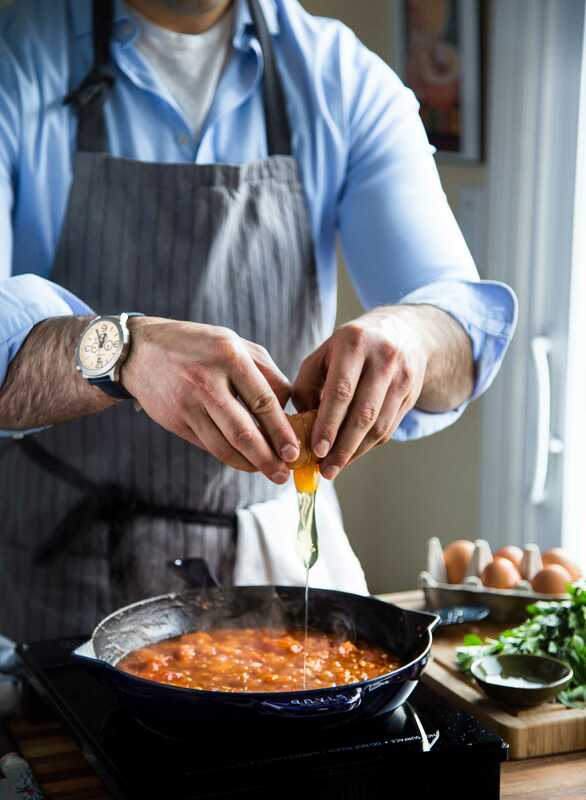 Hestan sent me this pan a while ago and I love it. If I win the lottery I might just buy a set (they run on the expensive side). As you can tell, this is not a sponsored post, but I really do love this skillet. 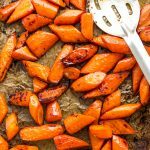 You’re also going to need to practice your knife skills here because you want all of the veggies in the mixture to be finely diced and equal in size. Big chunks of onion are the last thing you want. So take your time when doing the slicing and dicing. Your taste buds will thank you! Thirdly, these babies are totally clean. I’m talking real ingredients, no fillers, no binders, no dredging, no nada. I actually made these two ways when testing. With and without a dredging of arrowroot flour and I can honestly say that I preferred the cakes without the optional dusting. The colour was nicer and the texture was softer – which I kind a like. Fourthly (? ), the mixture for these cakes can be made ahead of time. You can double the batch measurements and set half the mixture aside in the freezer. 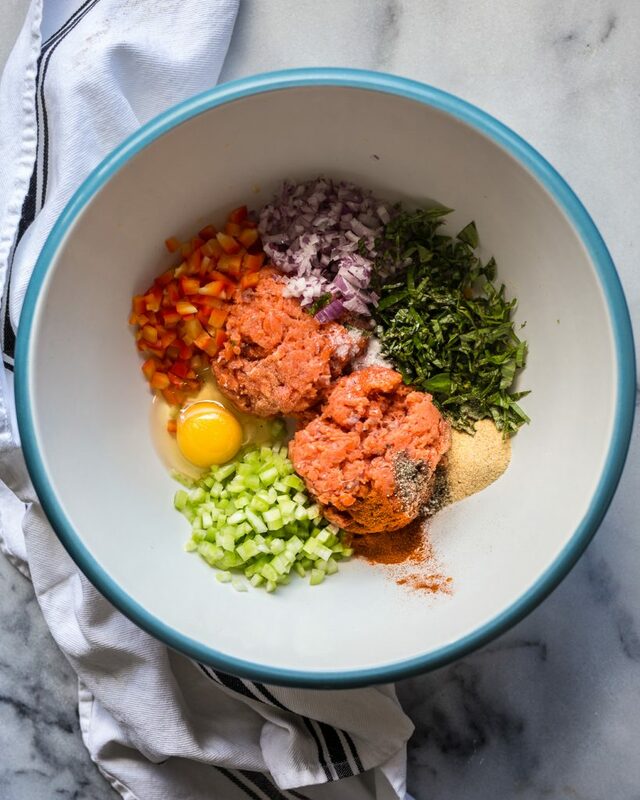 You can also meal prep the salmon cakes so you have something ready to grab in the fridge for meals throughout the week. Mine don’t usually last very long – they’re just too tasty! Last but not least, serve the salmon cakes with my Tarragon Aioli. It’s da bomb dot com and the anise-y flavour goes beautifully with the salmon. Don’t have tarragon on hand? TOO BAD! I mean, sorry, no substitutions here. You’re gonna have to track some down if you want the real deal! I have faith in you! 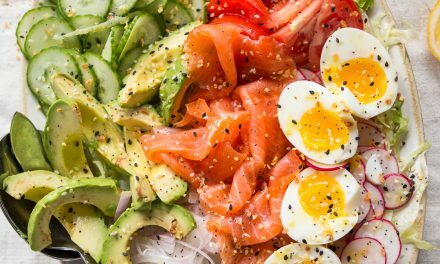 Add all ingredients to a bowl and mix until well-combined. Cover, set aside or refrigerate while you cook your Salmon Cakes. Using your hands, thoroughly combine all ingredients in a large mixing bowl. The mixture will be loose at first but after a few minutes it will come together and bind. Using a 1/4 cup measuring cup, scoop mixture and set onto a tray lined with plastic wrap. Do not form into patties just yet – read step 3 first. To prevent the mixture from sticking to your hands, rub them with a bit of avocado oil. Then, delicately form the balls into patties. See, much easier! Preheat a non-stick, cast-iron or high-quality stainless steel skillet set over medium heat. Add 2-3 tbsp of avocado oil and allow oil to come up to temperature before adding patties. *Tip: Avoid overcrowding the pan. Instead, work in batches. Cook patties 3 minutes then flip using a slotted fish spatula. Cook an addition 3 minutes for well-done. 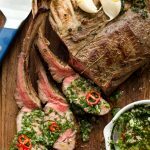 **Cook 2 minutes per side for a medium-rare centre. 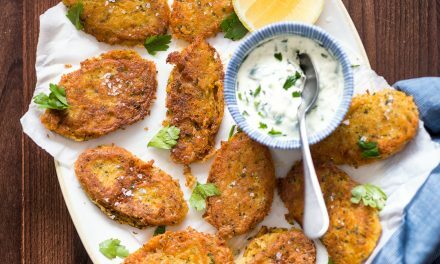 Transfer cooked patties to a serving platter and serve with Tarragon Aioli. Hey! I’m SO excited to make these, they look amazing. I have a question about salmon, though. Sometimes when I go into my grocery store, Publix, they don’t offer fresh wild salmon. I can either buy frozen wild salmon in the freezer section or buy the fresh farm salmon. What’s your suggestion? Wild salmon, even frozen, is far better than farmed in my opinion. 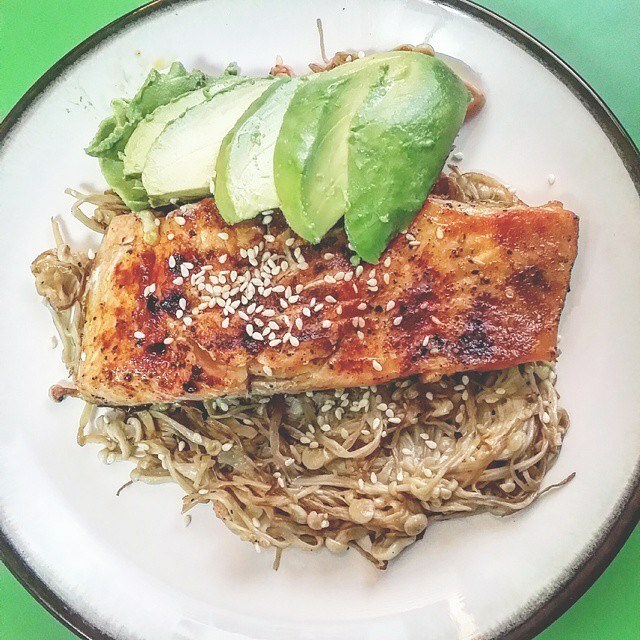 I recommend getting the wild salmon and allowing it to thaw before using it in this recipe. Note that it will likely have more moisture than an unfrozen, fresh filet of salmon. So be sure to take the extra step of patting it very dry with a paper towel. Would these be good cold, as an appetizer? 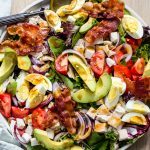 I personally prefer them hot, but I do typically keep the leftover cakes to top salads with or to have as a quick protein option if I’m a pinch throughout the week. 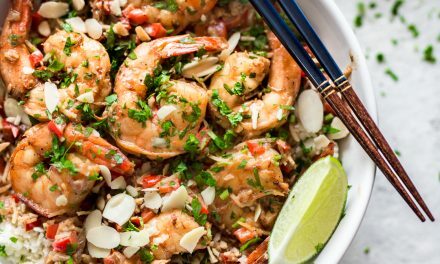 So, yes, they also would work as a cold appetizer if you want to make ahead. Thank you – I am going to try it! Do you think it would be okay to prep the mixture a day in advance (before cooking them on the cast iron skillet)? Yes! You can even form the patties and lay on a baking sheet a day ahead. Just be sure to cover them with some sort of plastic wrap. Excellent! Very glad to hear that you guys enjoyed and were able to speed up the process! HI! do you take the skin off your salmon before mincing it, or do you leave it on? 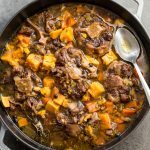 Definitely take the skin off for this recipe! I am excited to make these! About how many pounds/ounces to make 2 Cups minced? That’s a great question! Ballpark guess would be 1 lbs ??? I’ll have to make them again and measure properly.